We were commissioned to deliver a new Website Design for McCreery Cleaning Solutions based in Kilkenny. McCreery Contract Cleaning Solutions are the Market Leading Contract Cleaners in the South East providing Cleaning Solutions for both Commercial and Domestic Clients. 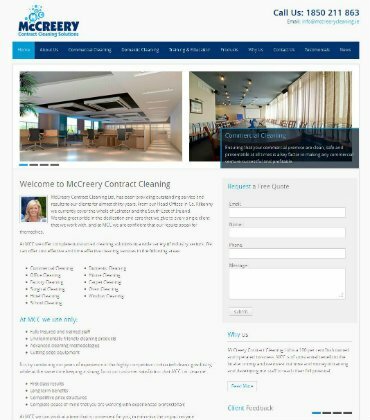 Our brief from the client was to deliver a new Logo Design and a new Website Design which would provide McCreery Contract Cleaning Solutions with a search engine friendly Website Design that would rank well organically and generate leads and sales for their business.